On May 19, 2018 the Shevchenko Scientific Society held it’s triennial General Meeting. The membership heard greetings from Dr. Leonid Rudnytsky, President of the World Council of Shevchenko Scientific Societies, and from Dr. Roman Kushnir, President of the Shevchenko Scientific Society, Lviv and proceeded to listen to reports given by the outgoing Board of Directors. Prof. George Grabowicz highlighted several accomplishments from his tenure, including the Shevchenko Jubilee Project which was created to celebrate the 200th anniversary of the Society’s patron Taras Shevchenko. Although the project has not yet been completed, a whole series of scholarly works on Shevchenko, have been published, either funded by, or partially funded by, the Shevchenko Scientific Society in the US and the Society’s Institute of Source Studies. Most notable is the revival of the Shevchenko Scientific Society Papers: New Series, which each member received as they registered for the meeting. The first of the Papers contain articles, reviews, and other materials in Ukrainian and English and is dedicated to the work of Taras Shevchenko. Also noted was the creation of a new series: Memoirs of the Shevchenko Scientific Society, which draws on archival material of the Society. The first book was dedicated to Mykola Velychkivsky. After other reports of the outgoing Board of Directors, the members of the Shevchenko Scientific Society elected a new President, Dr. Halyna Hryn. On the Executive committee: Dr. Virko Valey, first VP; Dr. Vitaliy Chernetsky, Learned Secretary; Dr. Anna Procyk, VP and Delegate to the World Council; Dr. George Grabowicz, VP and Liason for UIA and UVAN Projects; Natalia Honcharenko, Treasurer. Recording secretaries are Lev Chaban and Ivanna Bilych. Other board members: Juri Dobczansky, Library and Archives Committee Chair; Dr. Oleh Kotsyuba, Chair of IT Committee; Dr. Vasyl Lopukh, Chair of Membership committee; Dr. Alexander Lushnycky- Chapters Liason; Vasyl Makhno, Publications Committee Chair; Dr. Askold Melnychuk, Outreach Committee Chair, Dr. Olena Nikolayenko, Communications Chair; Myroslav Smorodky, Law Advisory; Dr. Andrew Sorokowski, Bylaws Committee Chair; Myron Stachiw, Scholarships and Grants Program Chair; Dr. Zenon Wasyliw, Finance Committee Chair; Dr. Myroslava Zanyenko, Institutional Liason; Dr. Roman Kuc, Audit Committee Chair. 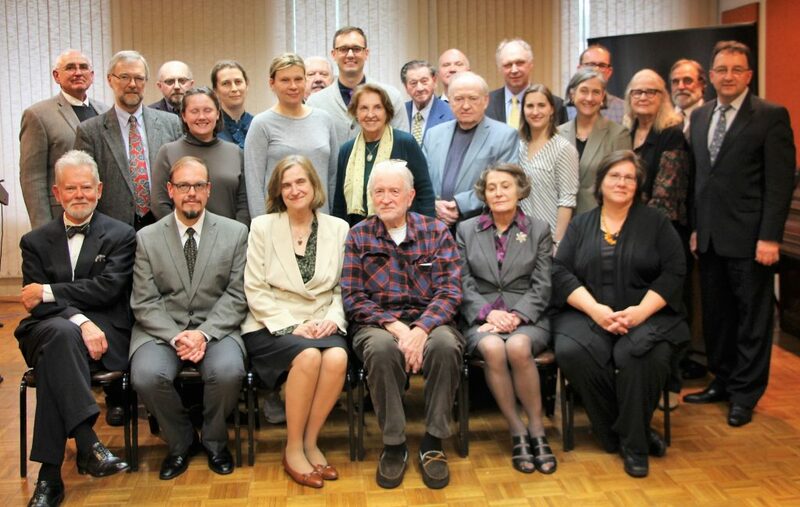 Members at Large: Dr. Margarita Balmaceda, Dr. Pavlo Gintov, Dr. Taras Hunczak, Christine Karpevich, Martha Kichowrowska Kebalo, Dr. Albert Kipa, Dr. Wolodymyr Petryshyn, Dr. Iryna Vushko. In her acceptance speech, Dr. Hryn thanked the outgoing Board for all its hard work over the past three years and congratulated the newly elected board. Dr. Hryn observed that many Ukrainian organizations such as the Shevchenko Scientific Society are experiencing generational turnover. As was evident in this election, a younger membership is stepping up to leadership positions to continue the work of their predecessors and to bring with them new ideas and innovation.